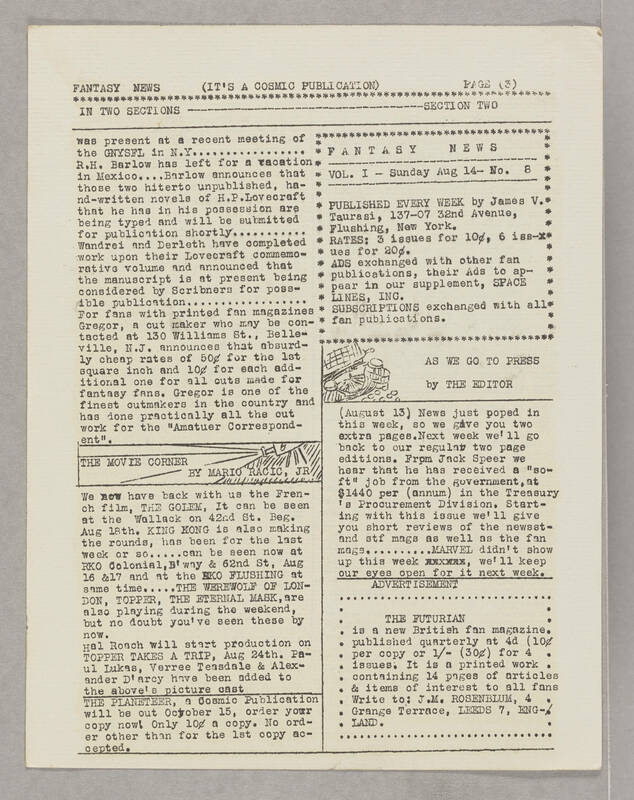 FANTASY NEWS (IT'S A COSMIC PUBLICATION) PAGE (3) IN TWO SECTIONS---SECTION TWO was present at a recent meeting of the GNYSFL in N.Y... R.H. Barlow has left for a vacation in Mexico...Barlow announces that those two hiterto [hitherto] unpublished, hand-written novels of H.P. Lovecraft that he has in his possession are being typed and will be submitted for publication shortly... Wandrei and Derleth have completed work upon their Lovecraft commemorative volume and announced that the manuscript is at present being considered by Scribners for possible publication... For fans with printed fan magazines Gregor, a cut maker who may be contacted at 130 William St., Belleville, N.J. announces that absurdly cheap rates of 50c for the 1st square inch and 10c for each additional one for all cuts made for fantasy fans. Gregory is one of the finest cut makers in the country and has done practically all the cut work for the "Amateur Correspondent". THE MOVIE CORNER BY MARIO RACIC, JR. We now have back with us the French film, THE GOLEM, It can be seen at the Wallack on 42nd St. Beg. Aug 18th. KING KONG is also making the rounds, has been for the last week or so...can be seen now at RKO Coloial, B'way & 62nd St, Aug 16 & 17 and at the [EKO?] FLUSHING at same time...THE WEREWOLF OF LONDON, TOPPER, THE ETERNAL MASK are also playing during the weekend, but no doubt you've seen these by now. Hal Roach will start production on TOPPER TAKES A TRIP, Aug 24th. Paul Lukas, Verree Teasdale & Alexander D'arcy have been added to the above's picture cast THE PLANETEER, a Cosmic Publication will be out October 15, order your copy now! Only 10c a copy. No order other than for the 1st copy accepted. FANTASY NEWS VOL. I - Sunday Aug 14-No. 8 PUBLISHED EVERY WEEK by James V. Taurasi, 137-07 32nd Avenue, Flushing, New York. RATES: 3 issues for 10c, 6 issues for 20c. ADS exchanged with other fan publications, their Ads to appear in our supplement, SPACE LINES, INC. SUBSCRIPTONS exchanged with all fan publications AS WE GO TO PRESS by THE EDITOR (August 13) News just poped [popped] in this week, so we give you two extra pages. Next week we'll go back to our regular two page editions. From Jack Speer we hear that he has received a "soft" job from the government, at $1440 per (annum) in the Treasury's Procurement Division. Starting with this issue we'll give you short reviews of the newest and stf mags as well as the mags mags...MARVEL didn't show up this week, we'll keep our eyes open for it next week. ADVERTISEMENT THE FUTURIAN is a new British fan magazine published quarterly at 4d (10c per copy or 1/- (30c) for 4 issues. It is a printed work containing 14 pages of articles & items of interest to all fans. Write to: J.M. ROSENBLUM, 4 Grange Terrace, LEEDS 7, ENGLAND.